Date – 22nd February 2018. Plaque sponsored by Ulster-Scots Agency. 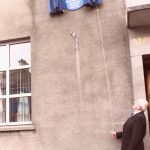 Unveiled by – Charles Annett, great nephew. Margaret Anderson known as ‘Mourne’s Florence Nightingale’ was born in the townland of Ballinran, Kilkeel but until recently had been largely unknown throughout Northern Ireland. 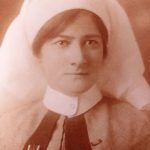 In 1919, for her lifelong commitment to the nursing profession at home, in England and overseas, as a Nurse/Sister/Matron, she was conferred with the highest award for nursing service in wartime. M argaret travelled to Buckingham Palace to receive the award from King George V.
Rev. 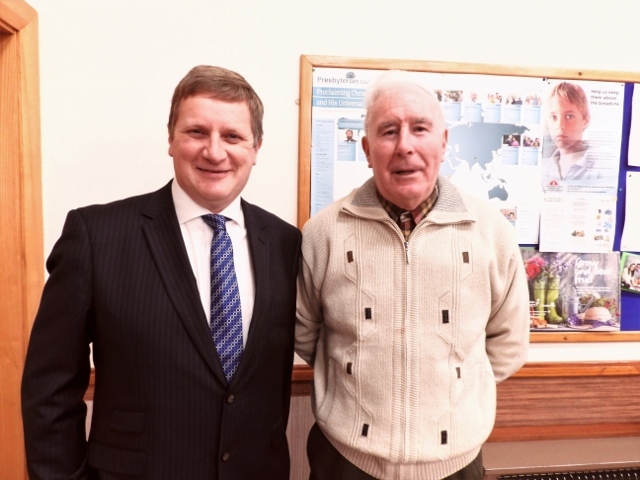 William Bingham of Mourne Presbyterian Church welcomed parishioners and guests to the Church Hall, before handing over to Chris Spurr, Chairman of the Ulster History Circle who introduced the plaque sponsor, Catriona Holmes from the Ulster-Scots Agency. 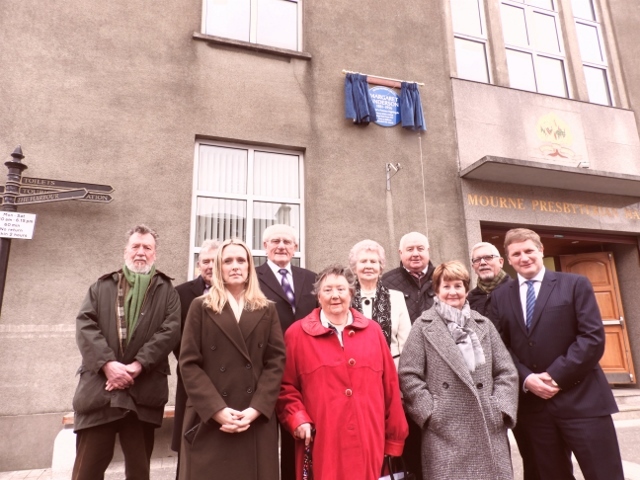 Catriona said that she was delighted that the community had heartily supported the blue plaque to the nurse from Mourne, and for her wonderful work which also included her appointment as Matron of the temporary hospital at the Silent Valley Reservoir, during the time of its construction. A fulsome account of Margaret Anderson’s life was given by Patricia Mackintosh of Mourne Local Studies Group. 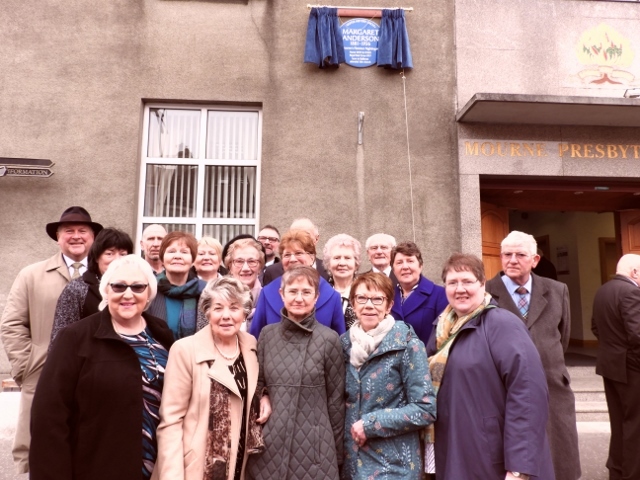 Charles Annett, the great nephew of Margaret Anderson spoke of his delight and pride at being asked to unveil the plaque, and regaled guests with some family stories. 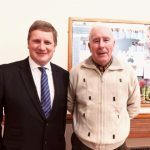 He told of the lantern given by the family to Margaret which she had used as she travelled in one of the ‘little ships’ to the beaches of Dunkirk to rescue the trapped soldiers in 1940. 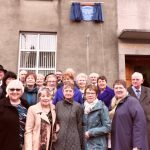 After the unveiling, guests were entertained to refreshments by the Ladies Church committee, during which time Anderson family photographs were on display. 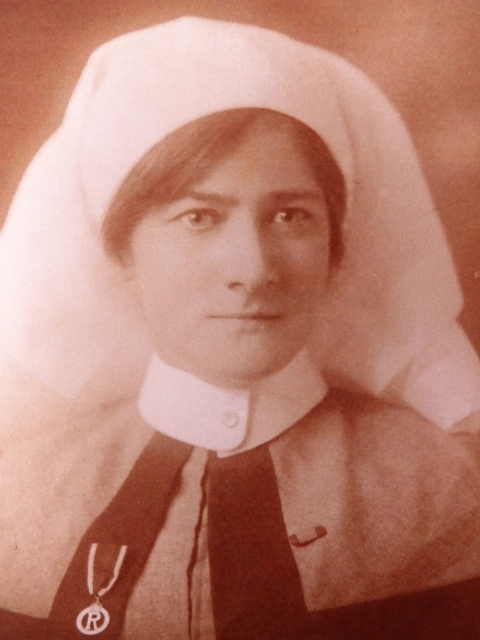 Many showed the dedicated nursing heroine from Mourne; no longer forgotten. 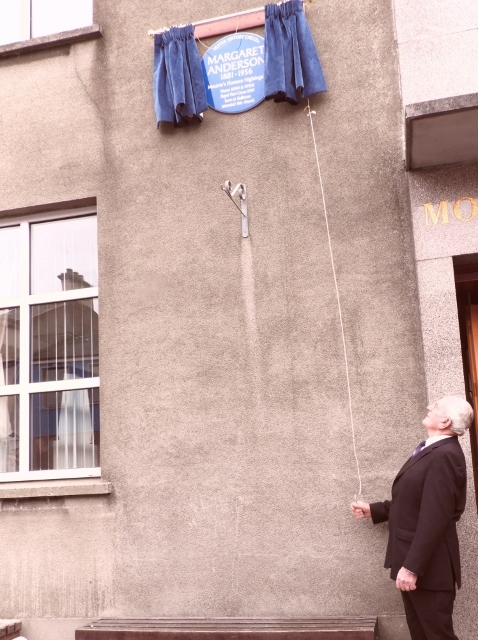 Photos from the unveiling event for Margaret Anderson Blue Plaque. Click on thumbprint photos to enlarge. 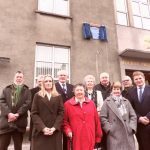 Chris Spurr, Chairman, Ulster History Circle; Tony Lundy, UHC; Charles Annett, great nephew; Eunice Annett; Maynard Hanna; Alan Boyd, UHC; Catriona Holmes, Ulster-Scots Agency; Patricia Mackintosh ,Mourne Local Studies Group; Mairead Ferguson, UHC; Rev. William Bingham.